LOUISVILLE, Ky. - The Gwinnett Stripers (5-4) were edged 3-2 by the Louisville Bats (5-5) on Saturday afternoon in game three of the four-game series at Louisville Slugger Field. 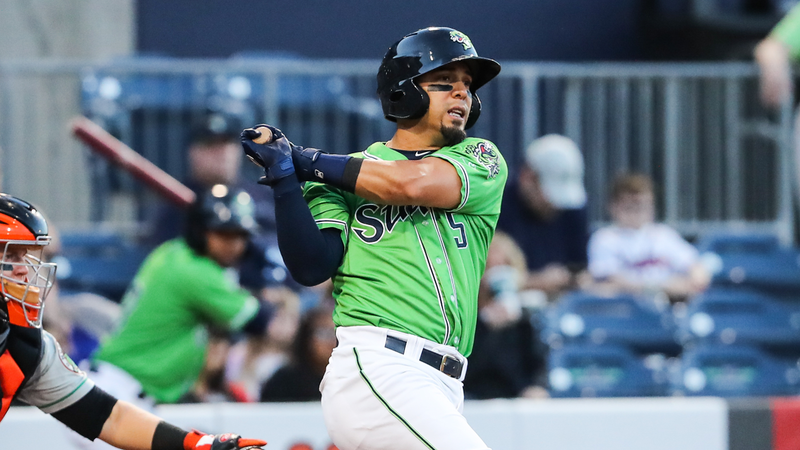 Scoring Recap: For the third straight game, the Stripers scored in the top of the first inning as Rafael Ortega (3) led off with a solo home run to right off Louisville starting pitcher Jose Lopez. The Bats tied the game at 1-1 in the bottom of the second on an RBI single by Nick Longhi off Stripers' starter Andres Santiago. In the bottom of the third, Christian Colon delivered a two-out, two-run double off the wall in left for a 3-1 Louisville lead. Gwinnett cut it to 3-2 in the eighth as Andres Blanco pounded a one-out double to center and scored on a single by Austin Riley. Adam Duvall followed with a single, but the Stripers stranded two in the inning and went down in order in the ninth. Stripers Stats: Santiago (L, 0-1), making a spot start in place of Touki Toussaint, worked 2.2 innings with three runs (two earned) on four hits. Stripers' relievers Elian Leyva, Shane Carle, and Jacob Webb combined for 5.1 scoreless innings. Blanco was 1-for-4 with a double, and Ortega was 1-for-4 with a solo homer. Bats Stats: Lopez (W, 1-0) went 6.0 innings with one earned run and four strikeouts to lower his ERA to 1.80 in two starts this season. Anthony Bass (S, 2) retired the Stripers in order in the top of the ninth to record his second save of the series. Postgame Notes: Blanco is 7-for-12 with two homers and seven RBIs in the series. Ortega has hit safely in eight of nine games this season. Riley's RBI single in the eighth ended an 0-for-13 slide in the series. Toussaint was recalled by the Atlanta Braves prior to the game, and pitcher Kyle Wright was optioned to Gwinnett. Next Game (Sunday, April 14): Gwinnett at Louisville, 2:00 p.m. Eastern. LHP Kolby Allard (1-0 0.00 ERA) will pitch for the Stripers vs. RHP Odrisamer Despaigne (0-0, 4.50 ERA) for the Bats. Radio Broadcast: 1:45 p.m. on 97.7 and 93.5 FM "The Other Side of the River."